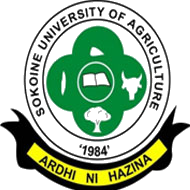 The Management of Sokoine University of Agriculture (SUA) invites suitable qualified Tanzanians, who are able to work in a dynamic academic environment to apply for the positions below. All applications should be addressed to the Deputy Vice Chancellor (Administration and Finance), P.O. Box 3000, CHUO KIKUU, MOROGORO to reach him 10 days from the date of this advertisement. Possession of a Secondary School certificate and a holder of Certificate in Driving Instructors from NIT or any other recognized Institution. Applicants with Diploma in Agro- Mechanics/Auto mechanics, with a proven working experience in relevant field will have an added advantage.